From left are Parr and members of the Luster family, Rebecca Luster Radford and Sarah Luster. 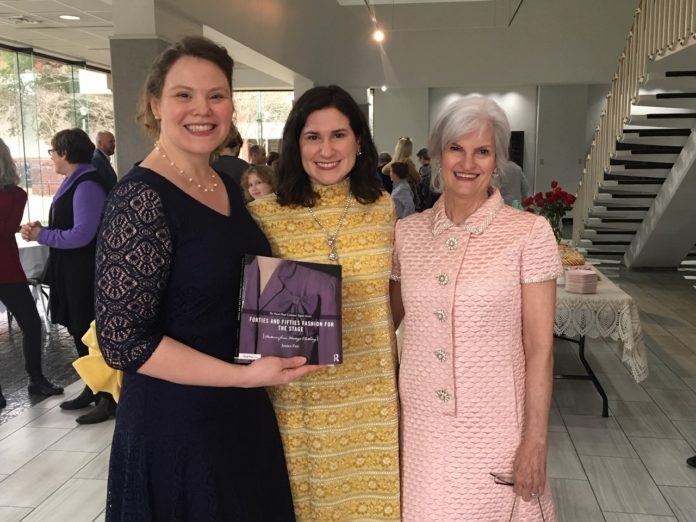 The opening reception for new Orville Hanchey Art Gallery exhibit “Forties and Fifties Fashion for the Stage,” was well attended Friday, Feb. 1 at the gallery. Items in the exhibit are featured in the book of the same name, written by NSU professor of costume design Jessica Parr. Many of the fabulous items featured are from the private collections of the Hogg and Luster families, specifically Becky Bill Page Luster’s items spanning from the 40s and 50s and Thelma Louise Firestone Hogg’s items from the 50s through the 70s. Besides the articles of clothing, several photos are on the walls, depicting fashion in this time period. In the reception area, Parr signed copies of her book. The exhibit will be at the gallery until Feb. 22. Wearing items from the collection and greeting guests were, from left, Sophie Stechmann, Kristi Contreary, Sarah Palmintier and Taylor Young. From the collection of Becky Bill Page Luster, this gown’s feathered peplum was a popular design detail in the 40s. Photographs like these adorn the walls of the gallery. From the National Archives, stockings like these worn by ladies at the Seattle Naval Air Station Spring Formal Dance, were so popular they were in short supply. This trio of dresses caught the eyes of many at the galley. On left is a full skirted dress from the 1950s, a style that gained popularity after war years. In the center, from the collection of Isabelle Shippee Shaffer, is a synthetic garment that became popular in the late 1950s due to its low maintenance and convience. At the end is a two-piece suit from the 1940s. This dress from the Luster family collection was beaded by hand. You usually won’t find this level of craftmanship in modern clothing. Sophia Hogg, great grandaughter of Thelma Louise Firestone Hogg, wore a gown from the Hogg collection at the reception. Behind her is a pink-hemmed blouse, never worned untucked, from the Hogg collection.